Big Bend National Park is an American protected area located in southwest Texas along the border with Mexico. Big Bend National Park is one of the most remote parks in the U.S.A. The closest commercial airports are in Midland, Del Rio, San Angelo and El Paso. The Big Bend is the name given to the great curve of the Rio Grande in the southwest part of Texas. The Rio Grande itself, known as Rio Bravo formed more than a 1600 km natural border between Mexico and the U.S.A. The area of Big Bend National Park occupies about 393 km of this dividing line. Big Bend is located about 110 km south of Texas City Marathon. The natural complex of the Big Bend is considered one of the most valuable and scenic areas along the Rio Grande and one out of two reserves along the river. It is of vital national importance because it represents the largest protected area of the Chihuahua desert. Big Bend National Park has an area that extends approximately 3, 242 square miles, with some areas going beyond it, as there are important sites for geological and paleontological points. The wealth of fossils found here is tremendous - archaeologists have found artifacts that date back over 9000 years, as well as historic buildings. Big Bend National Park visitors have the opportunity to learn about the lives of people from the 19th century. U.S.A territory is up to the middle of the deep valley of the river, and the south of it is already under the jurisdiction of Mexico. The oldest geology in the Big Bend National Park is about 300 million years old. Within this protected area, there are several small villages and tourist centers. Evidence of the earliest habitation of the park comes from 10, 500 BC, when the Indian tribes, Chisos, Mescaleros and the Comanche lived here. In recent history the inhabitance of Big Bend were associated with the English, Irish, Spanish and Mexican settlers and their agricultural farms. In the 18th and 19th century there were many farm areas where locals were raising sheep, goats and cattle. In the late 19th and early 20th century, the discovery of valuable mineral resources was the reason for building so many in mines in the area. In 1930, people came to the realization of the fact that Big Bend National Park is a land of unique contrasts and beauty, and is to be preserved for future generations. Three years later steps were made to protect the area, which is now named Big Bend. 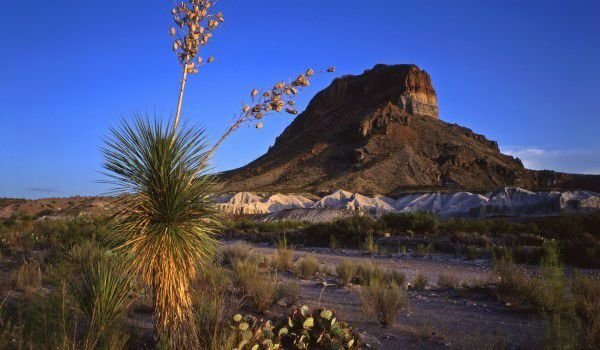 Although a place with very difficult climatic conditions and relief, Big Bend National Park is a place of life, with many plant and animal species. There are more than 1200 species of plants, including 60 different species of cacti, more than 600 animal species and about 3600 species of insects. They all inhabit the diverse natural landscape of dry, hot desert to the cool mountains in the fertile river valley. In Big Bend, one can be see pumas, rabbits , kangaroo rats, Mexican black bears, coyotes, eagles and many other birds. Because that is one of the most remote of all the parks of America, Big Bend National Park is one of the least visited. For the past few years, only about 300, 000 to 350, 000 tourists passed through the park boundaries. In the protected area there are well defined routes. One of the most popular is the Marufo Vega, following a picturesque valley on the way to and from the Rio Grande. The river is available for private boats, but to sail on it requires a permit. Big Bend National Park is well known to ornithologists, for the excellent conditions for observation of over 450 species of birds . 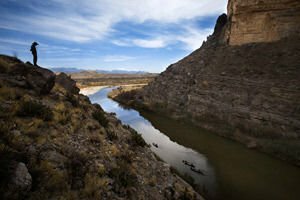 Among the most remarkable places in Big Bend is the Santa Elena canyon and well as the Chisos Mountains.